I don’t usually take much notice of those little e-card pictures and funny footnotes posted on Facebook, and apart from a quick giggle they are usually quickly forgotten. But for some reason, that one has stuck with me. It’s definitely something I worry about (as if I need any more to worry about! ), as a small part of that bigger whole “am I doing an ok job as a Mum?” question. My just-4 year old can use a computer scarily proficiently, and is great at getting her own drinks and setting up her own toys. My little one year old is developing her independence every day, and while I think it’s vital that they learn to be self-sufficient, I do find myself wondering if I should be actively making memories for them? I’m not talking about the big things, the family holidays and big days out. It’s more about the little things. When I think of my own childhood memories, they are of hanging out in my dad’s workshop, gluing stuff to other stuff. Memories of craft projects with my mum, and the smell of the vegetable garden, or being chased with the hosepipe on a hot summer day. I really don’t want my own children to just have memories of the back of mum’s laptop screen. I fear they will remember “shouty mummy” (more about her another day!) more clearly than loving, funny mummy. My own earliest memory is of standing on a train platform in London, with my mum carrying my brother in a sling, while something else (maybe shopping?) was in the pushchair and I was on foot. The pushchair had wide blue and white stripes, and it was dark. It all ties together to being the winter of 1981, although we’d moved away from London by then, so maybe I am making it up… memories are funny things. In fact, I’m not sure you can actually contrive to make memories, because the oddest things will stick in a child’s mind, and sometimes be more important to them than you could ever imagine at the time. My brother and I were recently talking to a family friend we used to visit when we were children. I remember her house by the sea, and the summerhouse in the garden where we used to play. My brother remembers the train, and I have no recollection of that at all. We’re both right, of course, and both of those things were there, but somehow we must have been living different summers at the same time. Our memories are not the same at all. Like I said – funny things. 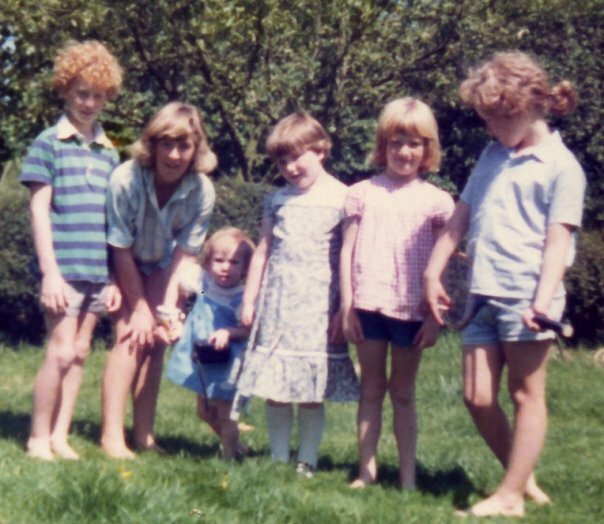 Looking through old photos, I see a little girl, the spitting image of my daughters, getting up to all sorts with her brother and sister and cousins. I don’t remember being her, but my mother can recall the very days the pictures were taken. So the memories we think we’re making for our children could be for us instead. I’ve seen “bucket lists” on websites like Pinterest.com, of things to do with kids, and the National Trust in the UK has put together a list of things to do before you are 11 and three-quarters. Where I’m from, Carnival season is like nowhere else on Earth. I mean it – it has to be seen to be believed. AltD1 properly saw her first in October this year. And she still doesn’t believe it. Having lasted 725 years, this was closed in 1997. A sheep once jumped over me there. True story. Speaks for itself really. Tents in the garden, later on the Common. Can I roll river swimming and canoeing into this one? 5. Car boot sales, scrapyards and farm sales. Chilly early mornings, treasure hunting with my dad. He taught me to haggle at 10: “What’s the best price you can do?” Skills for life, I’d say! Being part of these organisations from the age of 7 gave me so many opportunities. The Alt girls are already on the waiting lists for our local Rainbows. I won’t tell them about the Venture Scouts and the cider though – they can learn that for themselves! I still have 3. I am blessed. The saying goes “were you born in a barn?” Well, I was. The door at my parent’s barn conversion home is never closed. Even when it is, friends are always welcome. We loved visitors, whether they just popped in for a piece of mum’s legendary fruit cake, maybe to get my dad to fix something, or overnight stays with bike rides and extra kids to play with. All back to ours? Same still goes at the AltHouse! 9. Saturday morning breakfasts, sausages and bacon from the village, eggs from the back garden. Mum’s a good cook. That’s all. We must have argued and fought, but wherever and whatever, my memories are filled with hugs and laughing and belonging. I know that I’m lucky, and I hope the AltDaughters can feel the same one day.